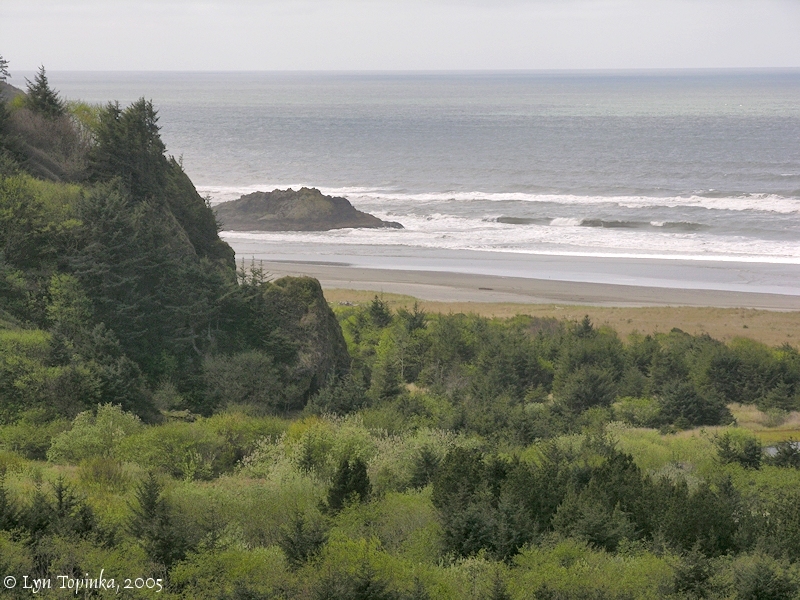 "Beards Hollow and Deadmans Hollow, Washington"
Click image to enlarge Pacific Ocean from Beards Hollow Overlook. Pacific Ocean, from bluff north of North Head, overlooking Beards Hollow, approximately 2 miles south of Seaview. On November 15, 1805, Captain Lewis reached the Pacific Ocean near modern-day Seaview, Washington. Image taken April 19, 2005. Beards Hollow is located at Cape Disappointment on the Washington Coast, south of Seaview, Washington, and north of the North Head Lighthouse. On November 15, 1805, Captain Lewis reached the Pacific Ocean near Beards Hollow. Beards Hollow was named after Captain E.N. Beard whose ship, the bark Vandalia, met disaster off the mouth of the Columbia River in 1853. The crew was lost and Captain Beard's body was found on the beach near the hollow. The mile-long West Wind Trail goes from the rocky outcrop of North Head Lighthouse to the old growth forests of Beards Hollow. From there one can travel the beach the four miles to Long Beach. 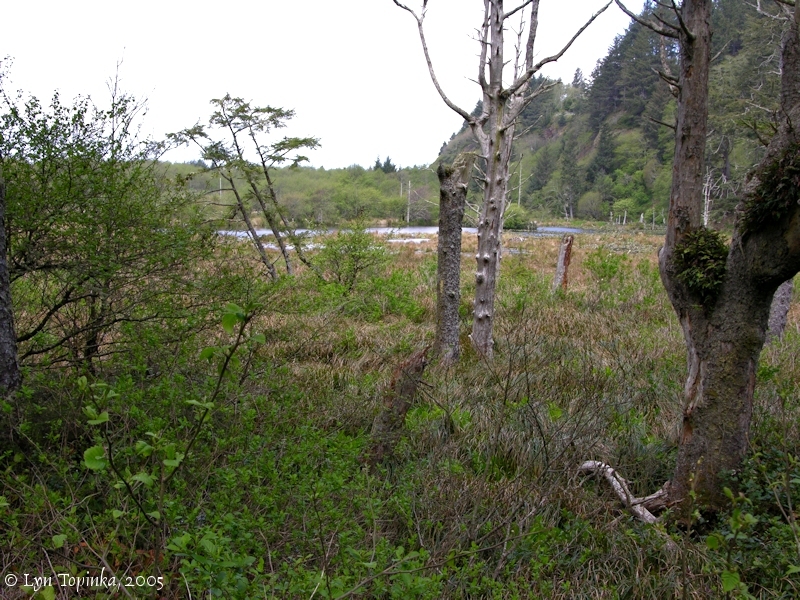 Click image to enlarge Treed area, Beards Hollow, Cape Disappointment, Washington. Image taken April 19, 2005. Beards Hollow and Deadmans Hollow were named for the same circumstances - the sinking of the Vandalia in 1853. However, Beards Hollow lies on the north side of North Head and Deadmans Hollow lies on the south. 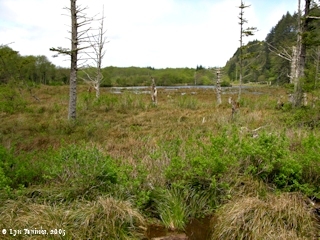 Beards Hollow: (T10N R11W Sec.32) A circular beach in a hollow at the base of a cliff, on Pacific Ocean, 1 mile west of Ilwaco, southwest Pacific County. It was named for Capt. E.N. Beard who ship, the bark Vanalia, foundered off the mouth of the Columbia River in 1853. All hands were lost, and Beard's body was found on the beach near this hollow. Deadmans Hollow: (T9N R11W Sec.5) A dangerous hollow on the Pacific Ocean, between North Head and Peacock Spit, southwest Pacific County. In 1853, when the bark Vandalia foundered at the mouth of Columbia River, all hands were lost and some of the bodies drifted into this hollow. Over a period of years, several drowned fishermen have also been found here. 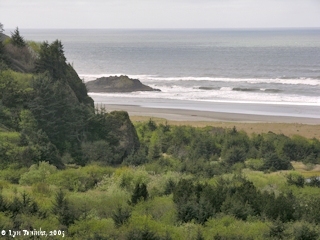 Click image to enlarge Beach at Beards Hollow and the Pacific Ocean, north of North Head and south of Seaview, Washington. 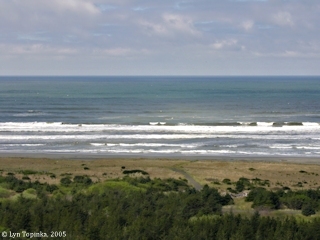 Pacific Ocean, from bluff north of North Head, overlooking Beards Hollow, approximately 2 miles south of Seaview. 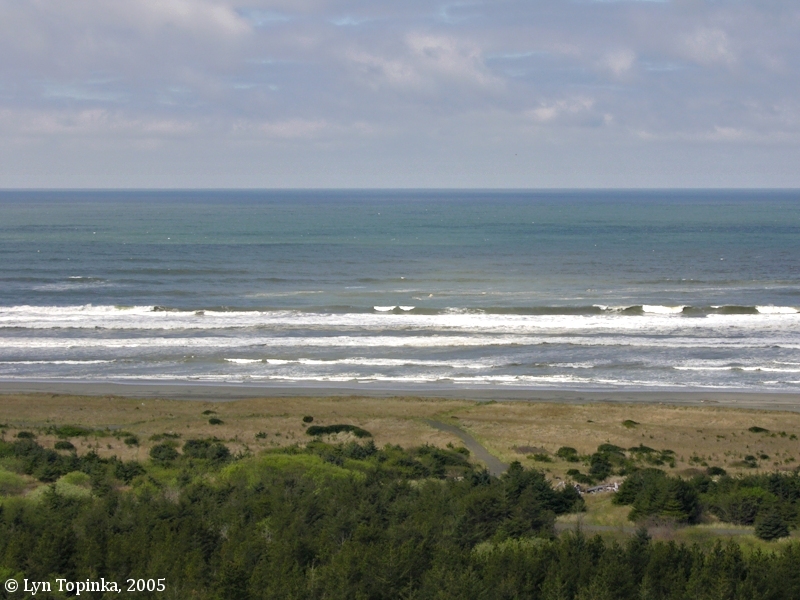 On November 15, 1805, Captain Lewis reached the Pacific Ocean near modern-day Seaview, Washington. 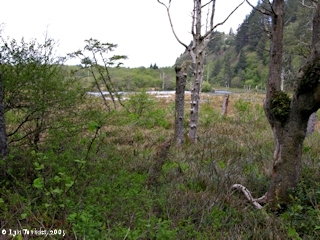 Image taken April 19, 2005. Click image to enlarge Penny Postcard: Beards Hollow, near Seaview, Washington, ca.1920s. Penny Postcard, ca.1920s, "View from Beards Hollow, Near Sea View, Wash.". Published by Wesley Andrews, Baker, Oregon. Card #625. In the private collection of Lyn Topinka. Click image to enlarge Penny Postcard: Dead Man's Hollow, Cape Disappointment, Washington, ca.1930s. NOTE: This is actually another view of Beard's Hollow. Penny Postcard, ca.1930s, "Dead Man's Hollow from Ocean Beach Highway, Long Beach, Wash.". Photo by Wesley Andrews, Portland, Oregon. Card #626, In the private collection of Lyn Topinka.